Journalists defy that journalism has a gender during the #GIJC17 Women and Investigative Journalism session this morning. WHEN I was 17-years-old I published my first article on Destiny Online. The title for my article was ‘The unapologetic woman’. At the time, the talk and ideas around feminism or being “woke” were not a popular discourse to me and my generation. But after timeless tries at getting published, following a need to be heard and understood beyond the surface of being a teenager with great ambition, Destiny Online gave me the platform. What inspired my words was the position in the world in which I found myself. As a young black woman living in “rainbow nation” South Africa, it became important that I speak from my experiences. And make public my insecurities about being socialised into these many boxes the world had prepared for me, before I could even spell or be acquainted with my agency. where I returned to what was more familiar to me. I became actively involved with Wits Sports, joined the Wits Citizenship and Community outreach program (WCCO) as Math and English tutor for learners in the Alexandra Township. It was also in this time that I merged my love for service and journalism, when I joined student leadership and Voice of Wits FM. Here I felt more fulfilled and through many talks with my lecturers I found an understanding to this colourful box I called my life. My experiences gave me a greater voice to how I believe students on campus should be. As university students we are positioned in a place of privilege more than anything to access information, experiences and opportunity to learn from each other. And we ought to adopt inquiring minds and an openness to be fully present in every moment in our university journey. It would be unfortunate of us to pay the thousands we do, only to get out with a certificate of validation on our learned abilities from the lecture halls. Ours should be the extended mission of being pioneers, leaders and visionaries who are both purposeful and impactful wherever we exist. When I took on the journalism honours programme, I had a slight anxiety as a person who was politically aligned, a journalist and a student leader. I feared the same reception as that of ANN7 reporters. The idea that people would question the credibility of my work because of the anticipated conflict of interest concerned me. But it was political activists and journalists such as Robert Sobukwe and Ruth First who helped me understand how journalism plays a good and important role in our democracy. I believe we need more public servants and journalists who push the agenda for a transparent and accountable government. As a student journalist and student leader, I believe I have a good and not necessarily perfect story to tell. 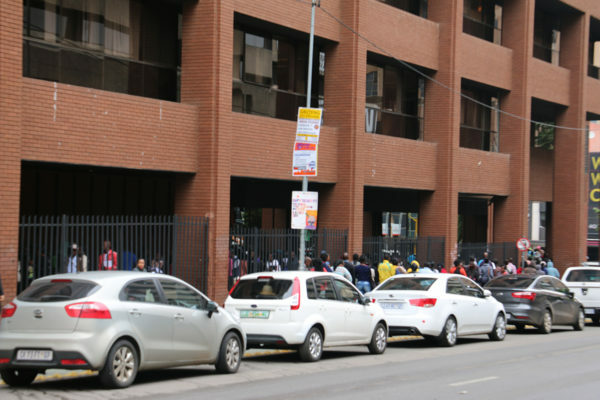 Over 400 people turned up at the Braamfontein offices of the Gauteng department of public works on Monday October 9, to apply for 45 cleaning posts. The department had advertised the vacancies at Johannesburg’s courts a week earlier. Wits University’s oldest residence, Men’s Hall of Residence, will be slaughtering a cow to celebrate their 95th birthday on September 29. The Wits Sports Council (WSC) has partnered up with the All Residence Council (ARC) to host a sports derby called Wits Sports challenges All Residence Council on Friday, September 22 at Diggz field on West Campus. The cost of printing has increased by two cents a sheet from September 1. A black and white A4 sheet has increased from 39 cents to 41 cents, a 5.1% rise. The A4 colour has increased by 4 cents from R2,88 to R2,92, a 1.38% rise. The average eight-page assignment will now cost R3,28 instead of R3,12. THIS YEAR’S JOZI Book Fair is moving off the Wits campus and will be held at Mary Fitzgerald Square in Newtown on August 31 to September 3, 2017. A restaurant on Wits West campus has started an initiative to empower female students by offering self-defence classes. Rita Berdanis, the owner of Zesty Lemon, says she got the idea after hearing about women who had been victims of violent acts. The student community at the Wits Junction Residence has collected over R5 000 for a cleaner whose home in Germiston burnt after a fire broke out nearby. Wits opens a public bid for Alex land to raise funds toward student accommodation. Wits University opened up proposals from development bidders who wish to partner with the university for the Frankenwald land, which belongs to Wits, located in the north of Johannesburg. The university’s decision to open the land for bidding came in response to the ongoing shortage of student accommodation which currently houses 6150 beds for a student population of more than 37 000.